Two resolutions returned by HHA Chairman Rob Davis at the direction of the Board Secretary Carmelo Garcia to re-appoint Charles Daglian failed in consecutive 4-3 votes. Reform members Mello, Lincoln, Stuiver and Burrell (via phone) voted against the re-appointment. Stuiver called the act of bringing back the resolutions illegal. Garcia read a legal review from an external lawyer on redoing a motion to reconsider or reintroducing a motion. But the vote was on resolutions voted down at the prior meeting. Garcia's reading of a legal motion being returned was inert to the failed resolutions being reintroduced at the meeting. A RFQ process will again be restarted. Law firms need to be given accurate information on the application process as in the recent past, some have not. leading into Thursday night's meeting. Talking Ed Note: A fast one failed - for the fifth time. 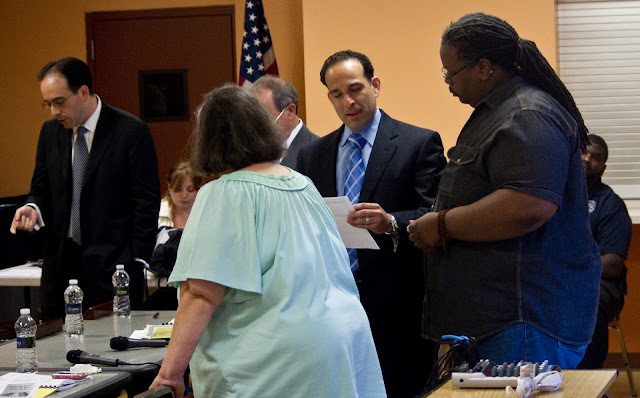 Will ED Carmelo Garcia get the message finally and allow another choice to be vetted through the RFP process or will he act insubordinately to the board? He complains about the extra cost incurred of $1,000 a month but fails to note his obstinance is preventing the HHA Board from moving ahead replacing Charles Daglian who has clearly lost the support of the body. Vision 20/20 was a topic of public speakers who were shown brochures of buildings from West Coast cities by the Board Secretary Carmelo Garcia. Photocopies of what Garcia called a plan was announced and he said it was available but none was offered. In a sidebar, the Director offered the latest annual audit report. When received, it will be made available. Complaints were made often and loud to the (reform) commissioners for not seeing approved Vision 20/20 at council meetings. The HHA residents don't appear to understand no funding has been approved for the first building and that no process has been completed on behalf of the full City of Hoboken. They've been led to believe there is political reasons holding up Vision 20/20 without any idea on what constitutes a true redevelopment process. At one point, commissioner Dave Mello tried to explain other buildings in town going up currently have undergone years long processes. The answer was not met receptively among a group of the approximately three dozen residents in attendance. At the end of the meeting, commissioner Eduardo Gonzalez was nominated and unanimously elected Vice President of the HHA Board of Commissioners. Mayoral candidate Ruben Ramos stopped by during the meeting and watched a portion of the proceedings.